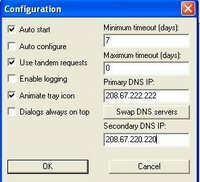 A DNS server translates a human address like google.com into a numerical IP address so your computer can take you to the right site. Usually, this takes a few hundred milliseconds to complete so it's barely noticeable, but over time, these milliseconds can really build up. Also, your ISP's DNS server isn't always reliable as witnessed by Comcast subscribers recently when their DNS server failed, leaving customers unable to access Google and other sites. By using OpenDNS and FastCache, you can solve the two problems of reliability and speed. OpenDNS runs a distributed network of DNS servers so using it is more reliable. It filters out bad addresses so phishers and spammers can't direct you to their site. OpenDNS also detects typos in the URLs you enter so entering craigslist.og leads you to craigslist.org. A piece of software called FastCache takes care of the problem of speed. It stores the IP address that is returned by your DNS server so your computer doesn't have to request it every time you want to go to a particular site, saving a few hundred milliseconds each time. 1. Once you install and start FastCache, you configure your computer to use it by going into Start->Control Panel->Network Connections. 2. Right click on the connection you're using and go to Properties. 3. Select Internet Protocol (TCP/IP) and click Properties. 4. 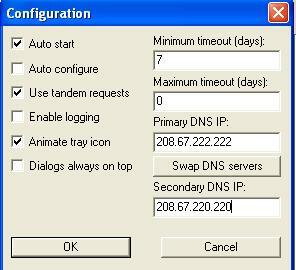 Choose "Use the Following DNS server addresses" and enter 127.0.0.1 as the primary.